This was an unusual case. 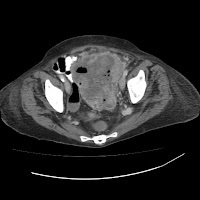 An elderly lady presented with abdominal pain, fevers, and an elevated WBC. The CT above demonstrated a massive, locally invasive tumor arising from the rectosigmoid region. Intraoperative findings were discouraging. The tumor was enormous, filling most of the pelvis. It invaded adjacent loops of small bowel and the entire posterior wall of the bladder. The tumor itself was completely necrotic, with the consistency of Thanksgiving stuffing. The entire lateral wall of the sigmoid colon was blown out. It was a mess. I resected everything en bloc and gave her a colostomy. At first we thought this was going to be a GIST tumor. But the final pathology actually strongly suggested an unusual variant of primary colorectal cancer; sarcomatoid adenocarcinoma, which is composed of a mixture of mesenchymal and epithelial cells. They tend to be extremely aggressive, fast growing cancers with almost universally poor outcomes. We'll enroll this lady in a experimental protocol once she has recovered suitably. Wow, so having that obscure point in Robbins on my pathology final was worth something? I may have to write my course director and congratulate him. Did she get a cystectomy and a loop urostomy or did you just peel it off the bladder? Back wall of bladde resected en bloc with tumor. Primary closure of bladder.